When living that RV life, you want to be as comfortable as possible when you’ve settled down for the night. Unfortunately, because mobile homes are designed to keep out the elements, they can be incredibly stuffy, particularly during the hotter months of the year. Considering that summertime is when most people hit the road, it’s imperative that you have a way to keep cool and avoid turning your RV into a mobile sweat lodge. Thankfully, most newer RVs have roof-mounted A/C units, but in many cases, all you need is a high-powered fan to stay comfortable. Today we’re going to be looking at the best RV vent fans, including a breakdown of the various features and benefits you should be aware of when comparing different models. Don’t suffer through the summer heat ever again! When it comes to RV vent fans, there are only a couple of different brands that make the best models on the market. Fortunately, they’re both incredible, although Maxxair is slightly better than the other, Fan-tastic. That being said, let’s take a look at what this fan can do, considering that it’s one of the most highly rated options you can find. One thing that I really appreciate about all modern RV vent fans is that they can move air into and out of your RV. For example, when you’re cooking, you want to get smoke and heat out of the kitchen as quickly as possible, and having a fan like this one can make it easy to do. Compared to other fans that only have three speed settings, this one provides the ultimate in both comfort and convenience. Ten different options ensure that you can make the most out of this fan, no matter where you are or what the weather is like in your area. Best of all, you can maintain the ideal circulation inside your RV, both when you’re inside and when you’re not. Because this fan can operate at both low and high speeds, it’s much easier to finesse the best solution for your situation. Although having an electronic keypad is usually convenient enough, this fan takes things up a notch by providing a remote control as well. Unfortunately, the remote does require you to have a line of sight when using it, meaning that if you want to adjust the fan from a different part of your RV (or you’re behind closed doors), you won’t be able to easily. Nonetheless, having the remote can still make this fan much more accessible, especially if you want to remain comfortable all day and night. With most RV vent fans, there is a filter on the inside to help keep things like dust, bugs, and other debris from collecting inside your mobile home. However, these filters are not as efficient, and they can get dirty fast. With this fan, you get an exterior covering that enables you to use the mechanism all day long without worrying about other elements coming into the RV. An extra layer of protection provides peace of mind, especially if you run the fan at night. Overall, this is probably the most convenient and easy to use RV vent fans I’ve seen. I love that it has so many speed settings, and the remote is highly useful, even if it’s not as versatile as I had anticipated. I highly recommend this fan. Although all vent fans make noise, this particular model can be quite loud at the higher settings. Also, if you like the idea of controlling the unit from your bed, you may be in for a nasty surprise when the remote doesn’t work unless it’s within the line of sight. In most cases, when choosing the best RV vent fan, you’ll want to install a brand-new model into your RV. However, in some situations, it’s much easier and more cost-effective to swap out the fan inside the vent instead. If you don’t like the idea of having to pull your vent out and deal with all of the hassles that come with it, then check out what this upgrade kit can do for your RV. This particular model is ideal for vents that don’t currently have a fan inside. Even if your RV vent does have a fan, this unit may be better equipped at moving air in and out of your mobile home. With a high-efficiency design, you can recirculate the air inside your RV much faster than usual, making this model an excellent upgrade. If you don’t currently have a fan in your vent, you’ll be impressed by how well this device helps cool your mobile home. To make things easier for you, this fan comes with three intake settings and two exhaust settings. Although these are manually operated via a knob on the fan itself, this kind of versatility ensures that you’re always comfortable inside your RV. Although this fan is not as robust or as reliable as some of the other models we’ve seen, it’s a perfect addition to any RV that just has a vent. I like this unit because it’s much easier to install than other fans, and it works wonders. Compared to the other fans on this list, this particular model isn’t at the top. Not only does it not come with as many features, but it can be quite loud, especially at the highest setting. Overall, it’s perfect if you don’t have a fan already, but not much beyond that. As I mentioned, Maxxair and Fan-Tastic are the two primary manufacturers of RV vent fans, so you know that you’re getting quality when picking either one of these brands. Although this particular fan isn’t as high-tech as the model above, it’s perfect for most RV enthusiasts. Let’s see what it can do. Yes, having 10 speeds does offer more variety and control over the circulation in your RV, but in many cases, it can be somewhat overkill to have so many options. In many cases, all you need is a slow, medium, and fast setting to get the comfort you need inside your RV. As with other models, you can pull air in from the outside, or you can blast the inside out outward so that it circulates faster. Either way, this model will help your RV’s climate stay as neutral and as comfortable as possible. Compared to some of the other fans on this list, this unit is much quieter. It’s so soft that, in many cases, you won’t even remember that it’s on. In fact, that could become an issue, assuming that you forget to turn it off and it drains your battery. Although that situation won’t often happen, just be aware that this fan is a lot less noticeable than others, so plan accordingly. One thing that Fan-Tastic does better than Maxxair is that they have fans that double as sunroofs. Because the lid is translucent, you can get more natural lighting into your RV, making it ideal for the summer months. Also, because it’s not clear, you don’t have to worry about glare or anything negative like that. If you’re in the market for a fan that is easy to use and comfortable for all-year-round, then this is an excellent choice. I like that it doubles as a sunroof, and that installation is a breeze. While I do prefer a remote control this fan is easy enough to operate as it is. In some cases, the motor on this fan can emit a high-pitched whining noise. Considering that it’s whisper-quiet operation is a selling point, this noise can be a huge problem. However, assuming that your model doesn’t experience this, it will be perfect for your RV. We’ve already seen what Maxxair can do with the top-of-the-line model, but this is a perfect example of a streamlined fan that delivers high-quality performance without too many bells and whistles. Assuming that you don’t care about getting the upgraded materials with the other Maxxair system, this fan will be ideal for almost any RV. One thing that you may be surprised to learn is that the majority of RV vent fans have to operate with the lid open. For the most part, this setting makes sense, considering that you’re trying to recirculate the air inside. However, if it’s raining or extra cold outside, then you don’t want your fan to be open. In that case, you can utilize this model as an interior ceiling fan. I appreciate the fact that you can circulate air without having to open the lid, and this is a unique feature that I’ve only seen with Maxxair. When installing this fan, you’ll notice that it mounts a lot closer to the roof than others. While a massive vent fan doesn’t cause any problems per se, having this kind of mounted lid means that your RV is a bit more streamlined, and it can close a lot easier. That being said, one of the problems with this particular model is that the lid can only be opened and closed manually. I prefer one that can be operated via the remote, but overall, it’s not too much of an issue. When comparing this unit to other RV vent fans, you can take a look at the airflow rating to get a sense of what it can do. While other fans only move up to 200 cubic feet per minute, this model can get up to 900 CFM. With that in mind, recirculating the air in your RV is a breeze (literally), but that kind of airflow can be relatively loud, so don’t assume that it will be whisper quiet when moving that kind of air in or out of your motorhome. This fan comes with the same reliability as the other Maxxair unit. I appreciate that it can be used with the lid closed and that it has so many speed settings. Overall, you can feel extra comfortable with this fan, no matter what the weather is like outside. I’m a bit spoiled when it comes to vent lids, so I really appreciate models that are electronically operated. Also, this fan can be super loud when at the highest setting. Finally, if water drips into the vent, the filter on this unit can rust relatively easily, so keep that in mind. Although this is the last model on our list, it’s certainly not the least-desirable one. In fact, I would say that this vent fan is probably better than the other unit from Fan-Tastic, mainly because it’s so fancy and high-tech. Let’s see what it can do. With so much technology existing in the world of RVs, it’s hard to believe that this kind of feature hasn’t become more widespread. One of the most significant issues with RV vent fans (and vents in general) is that you have to remember to close them when it starts to rain. If you’re not inside your RV at the time, you run the risk of having a wet interior that will need to be dried and cleaned. Fortunately, with this fan model, you don’t have to worry. An integrated sensor will close the lid automatically when it starts raining, making this unit much better than most. The only thing that would make it perfect is if the fan could operate when the lid is closed. Although Maxxair is well-known for having remote controls for its fans, this unit also comes with one, so feel free to upgrade as you like. As with other fans, this unit also comes with a mounted keypad, enabling you to control the device however you want. You can either set the fan speed manually or adjust the temperature in the RV, and the fan will work accordingly. During the hotter months of the year, having a fan running at night is going to make sleep much more comfortable. However, if you’re not plugged into shore power, then you run the risk of waking up with a dead battery. Thankfully, this particular fan doesn’t draw many amps, meaning that it can run all night long without killing your RV in the process. Feel free to use it whether plugged in or boondocking. Overall, this is a high-tech fan that comes with just about every feature you could want. I love the rain sensor, as well as the remote control with temperature settings. Compared to some of the other fans on this list, you can’t do much better than this. The lid on this vent fan is not as rugged as others. In some cases, a gust of wind could take it off of the hinge, leaving your RV totally exposed. Also, in rare instances, the motor may start to vibrate, which can cause a lot more noise than normal. One of the best things about choosing the best RV vent fan is that you never have to worry about compatibility with your motorhome. Thankfully, all RV manufacturers follow the same standards when incorporating roof vents, which means that they are all 14x14 inches. Thus, no matter what fan you get, installing it into your motorhome is going to be a snap. Do you have pets living in your RV? At first, this question seems a bit unrelated to vent fans, but the fact is that there may be times when your pets are sitting in the RV while you’re away on your next adventure. Although this probably won’t happen often, you need to be careful whenever you’re in this situation. Having the best RV vent fan means that you can leave it running so that your pet doesn’t have to sit inside a sweltering mobile home all day. During the hottest months of the year, having a fan on at all times will be necessary, even if you’re only gone for a little while. How Is a Rain Sensor Solution for Pets a Bad Idea? We’ve seen a vent fan with an automatic rain sensor. While this feature is more than helpful, it can sometimes be a problem when you have pets inside. The issue is that since the fan won’t work when the lid is closed, your furry friend won’t be able to stay cool if it starts raining. Unfortunately, you may not be able to turn off this setting, so be aware of the potential downside and consider it when making a final decision. The Height of Your RV Ceiling? Because most modern RV vent fans have an electronic keypad controller, you need to be aware of where you can mount it inside your mobile home. If you have a massive Class A rig, then you’ll need longer wires, assuming that you want to keep the keypad within reach. For most Class B and C motorhomes, a new vent fan won’t pose any issues, but just be sure that you measure everything before starting the installation process. You don’t want to find out that the wires are too short after the fact. 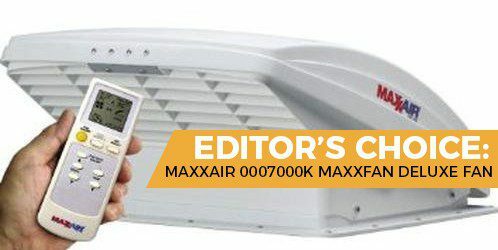 As I mentioned when reviewing it, the Maxxair MaxxFan is probably the most high-tech and reliable option out there. When looking at it compared to the other fans on this list, you can instantly see why it’s my top pick overall. First, I appreciate the fact that it comes with an intake filter, which helps keep bugs, debris, and rain out of your RV. Second, I love that it operates electronically, ensuring that you can open and close it remotely. Finally, this fan is one of the most versatile, with 10 speed settings and a remote control. If you were to use this model side by side with others, you would notice that it runs a lot smoother and can keep your RV’s climate in perfect condition all year round.